Two weeks ago I moved from Colorado to New York City. I lived in the Aspen area for almost three years. Originally, I moved to Old Snowmass to work with Amory Lovins. I stayed for the beautiful mountains and the inspiring work and colleagues. Three years in Colorado have made me feel very connected to nature. Whether I’m out hiking alone or “skinning” up a mountain with friends on our way to a hut—being in nature makes me happy. I have always appreciated being outside, but Colorado has strongly increased that appreciation. As I meet new people in NYC, I even find myself describing my identity through all my past and future outdoor trips. Luckily, I moved in with friends who share this deep appreciation for nature. Brendan Coffey, who generously offered me a room, mentioned during our first evening together that he wants to spend at least one day each weekend outside the city. What else could I wish for? I’m excited about upcoming expeditions to the Catskills, the Berkshires, and the Hamptons. That said, I will miss waking up with the sunrise, looking out over Mount Daly, Capitol Peak, and Mount Sopris as I make my breakfast. Interestingly, I notice that New York’s cityscapes convey a certain beauty too, particularly during early morning or late afternoon light. I struggled to connect with a diverse network of people in Aspen, the way I had in Cambridge or Amsterdam. In NYC, this is changing noticeably—I am invited to countless interesting gatherings, and find myself lying in bed at night thinking about the wide array of people I met that day. There is, however, a beauty to living in a small mountain town: you start to know everyone around you, at least by face or name. I knew most people I went to a yoga class with, I knew the local grocer, and I knew the barber. Living in a small community makes you feel that you’re there for one another other. That said, I think building connection to your local community is possible in NYC too. It just requires a concerted effort. On a Sunday trip to Beacon, a small town about an hour outside of New York, I was inspired by a friend who introduced himself to employees at the local bakery, bike shop, and art studio. I notice that I can get to know strangers in NYC too, if I smile, ask for and listen to their personal story, and share some of mine. Two key reasons I wanted to move to New York were to build community and to be part of a diverse, multicultural city. Both desires are already being fulfilled. Together with Brendan, I started a “Curious Conversations Club”—a monthly gathering with a group of friends to dive deep into a book or documentary discussing an important topic. To grow my contribution to a diverse, multicultural city, I plan to start actively volunteering for local causes. Recent “three magi” dinner in Amsterdam, organized with Tim Manschot. This is exactly what I hope to create more of in NYC. One blessing of living in the Colorado Rockies is the very limited distraction around you. You can focus your days on just a few core activities. In NYC, you end up spending more time thinking planning your transport or choosing from an endless menu of food options. However, I notice that it’s actually easier than expected to live a focused life in NYC. I am fortunate that my home is a 15-minute walk from the office. By having breakfast at home and lunch at the office, I don’t need to consider food options much. Regular exercise and daily walks also improve my ability to focus. Also, being “alone in the mountains” may make it easier to focus, but I find that to be most productive, and to have more creative ideas, the brain also needs a lot of input. Exactly this is what I find in NYC. Following Stephen Johnson’s notion that good ideas come from lively interactions and bringing together diverse experiences, life in a big city may end up being more productive than life in a small mountain town. I am stoked to be in NYC. I can’t wait to nurture deep friendships with the people around me, and I love exploring this amazing city. At the same time, I feel grateful for having spent three years in some of the most beautiful mountains I’ve ever seen. Very few people live in a place like Colorado’s Roaring Fork Valley in their mid twenties. Colorado has given me a deep (I’d like to think lifelong) appreciation for the outdoors, and the mountains have helped me become more patient and feel at peace internally. Where have you lived? What city or town do you remember most fondly? Do you want to spend the rest of your life in cities or in small towns? How do you choose where you want to live? Please share your thoughts in the comments section below! I just returned from a 10-day Vipassana meditation retreat at the California Vipassana Center (CVC), in the style of S.N. Goenka. For 10 days, I took a vow of silence, meditating for 10 hours each day, starting my first daily meditation at 4.30am and ending the last at 9pm. It was without doubt the most formative experience for me this year. Why? Please read on. Vipassana is a meditation technique rediscovered by the Buddha 2500 years ago. The technique was developed as “a universal remedy for universal ills”. Does that sound a little lofty? Let me explain. Your mind has a habit to respond to external objects with craving or aversion. These cravings and aversions create suffering. For example, when you see a delicious pastry while standing in line at the coffee shop, but a customer ahead of you orders the last one, you suffer. When you miss the bus and are condemned to wait for the next one, while feeling miserable about the cold weather, you suffer. Vipassana is a technique to unlearn these cravings and aversions, by accepting reality as it is. In Vipassana, you use the mind to observe sensations on the body without reacting to them. If, after sitting cross-legged for half an hour, you feel pain in your right thigh, you do not respond by moving your leg. Rather, you objectively observe, “Ah, I sense pain in my upper right leg”, and investigate the sensation further (e.g., do you feel heat, pulsation, or perspiration?) in equanimity, without moving your leg. By training the mind to not automatically respond to sensations, but to observe them in equanimity, you can unlearn the habit that causes human suffering.These 10-day courses are meant to establish and deepen one’s daily practice. It certainly takes many years, if not lives, to fully liberate the mind. However, a steady daily practice can get you very far. The first three days of the retreat are used to increase one’s awareness by focusing on the sensation of breath, using a technique called anapana breathing. On the first day, you focus on sensations in the entire area of the nose. You gradually reduce the area of focus to only the entrance to the nostrils, with the purpose of sharpening the mind’s ability to detect sensations. Then, after you have trained the mind to notice sensations on an area the size of a few fingertips, you are introduced to the technique of Vipassana. Essentially, Vipassana consists of different ways of “scanning” your body for different sensations, and observing these sensations in equanimity. The first days of practicing Vipassana you will notice only gross sensations, such as a pain in the upper leg, or the movement of your lungs due to incoming or outgoing breath. Within a few days, your awareness sharpens to experience sensations on every tiny part of the body. Ten days without speaking is a fantastic experience. Taking a vow of silence enables you not to focus any attention on others, which is where we normally spend most of our awareness. This creates a whole new reality. You can fully focus on the taste of your food, the touch of your feet on the ground, or the sensations on your skin. Silence becomes sacred. The mind is incredibly active. Ten days without speaking does not feel like ten days of silence. Your mind is filled with internal monologue. Especially in the first days, hundreds of ideas pop up. And it’s not just the volume of ideas—the type of thoughts is fascinating, too. I had elaborate memories of my time as a teenager and student that I had not thought about for more than five or ten years. Because you agree not to read or write during the course, you can’t write down any of your ideas. This is an interesting exercise in itself. In everyday life, I have developed a strong habit to capture every idea or to-do in a physical or virtual notebook. To respond in equanimity to these ideas, I had to let go of attachment, believing that the truly important ideas would come back to me at a later point. I had to remind myself that I came here to practice Vipassana, not to think about other things, and let the idea float away (by focusing my awareness on my breath of sensations). Cultivating awareness and equanimity is possibly the most important path one can embark on. When “Noble Silence” was lifted on the 10th day of the course, my first long conversation was with Jerry, a businessman from Vancouver, Canada. Jerry told me that he participated in his first Vipassana retreat 42 years ago in India, and had done more than 60 retreats since. Jerry—a successful businessman, with a happy family, in good health—said that his daily Vipassana practice was the most important gift in his life. I don’t think that Jerry’s statement was an exaggeration. Vipassana is part of the path of Dhamma. According to the Buddhist Noble Eightfold Path, Vipassana should be combined with a virtuous life (right speech, action, and livelihood) and increased awareness (right effort, mindfulness, and concentration). To me, it is only logical that committing to live a virtuous life, to further develop one’s awareness, and to continue to develop wisdom by equinamously observing the senses will have a profound impact on a human life. The people who most inspire me—whether historic characters who I have learned about through books, or individuals who I have had the good fortune to become friends with—live a life of high morality. They practice selfless service. They realize they are flawed, and work on those flows. They actively work to reduce their sense of ego, self-importance. I think that Vipassana can help me cultivate these characteristics. That does not mean I think it’s the only way (I know people who find practical inspirations in many other techniques, religious and non-religious) or that it’s fully complete (for example, I think daily readings about virtuous exemplars may further benefit our compassion actions), but it is a technique that resonates with me now, that has clear merits, and that I can practice. Taking a Vipassana course was not easy, but it was so worth the effort. In the last week and a half, I have been offered a concise view of the good life, and more uniquely, a specific path to develop that good life, step by step. I look forward to grow on this path. I have committed to sitting twice a day for the next year, and I will sign up for a follow-up course in 2017 this week. Please let me know if you’re interested to join, or if you have any questions. There is much more to share that I do not cover in the post above. For example, the retreat is made possible entirely by donations: teachers and all kitchen staff volunteer their time and expenses for lodging and meals are paid for by previous donations. This means that anyone, no matter what economic status, can join, which I found to be very refreshing. This is not a wealthy person’s escape. Last Friday, I helped to install a solar photovoltaic array of more than 500 solar panels. The array will provide 35-40 low-income households with clean, affordable electricity—enabling savings of up to $500 per household per year. The installation was organized by GRID Alternatives, a non-profit that brings together community partners, volunteers, and job trainees to implement solar power and energy efficiency for low-income families. On a crisp Friday morning, under a cloudless Colorado sky, approximately 40 of us gathered for a short safety instruction. The solar array was to be installed in the back yard of Yampa Valley Electric Association (YVEA), a small electricity company that serves about 25,000 customers in Northwest Colorado, employing more than 60 people to do so. Many of the volunteers were Yampa Valley employees: my team of six included two linemen, a woman from Yampa Valley’s HR department and a woman from the finance department. Volunteering reminds you that to give is to receive. Since Friday, I have had multiple moments in which I realized how much I got out of a day of volunteering. Upon reflection, here are three reasons why volunteering can be so fulfilling. First, volunteering can give you a peek into other peoples’ lives. Someone in my installation crew had been fixing distribution wires for 16 years. Sixteen years! Others had lived in Steamboat Springs their entire lives. Many of us—whether you work as a software engineer, a consultant, or lawyer—live in a tiny bubble. By volunteering, you are exposed to different views of reality. This is further amplified when you volunteer in a developing country, yet even when you volunteer in your municipality, you will likely encounter foreign views. Second, you can learn new things by volunteering. Related to the previous point, the exposure to people you wouldn’t otherwise meet can teach you something. It can expand your “unknown unknown”: the things you didn’t even know you didn’t know. Steve, a lineman at YVEA, told me how his crew inserts a liquid into underground distribution-grid lines that will solidify, protecting underground wires from corrosion and improving their insulation. This can extend lifetime by as much as 10 years. Similarly, I learned that solar PV modules need a “WEEB” that penetrates the structure, to ground the panel in case of a short-circuit or lightning strike. Third, it’s truly fulfilling to build things by hand. At the end of the day, my crew and I had installed about 100 solar PV modules. To see a structure materialize over the course of a day, to spend a day working in the sun, to feel your muscles when you lay down at night—these are blessings for someone who spends most working days in an office. If you want to try installing solar yourself, GRID Alternatives has opportunities around the United States. Visit GRID’s website to find specific opportunities. GRID will have a big “solarthon” in Fort Collins, Colorado October 20-22nd. Contact Allison Moe amoe [at] gridalternatives [dot] org for more info or to sign up! When was the last time you volunteered? In what capacity? Do you have, or did you ever have, a regular volunteering practice? How does it feed you? What is difficult? Thanks to Tom Figel and Allison Moe for creating this opportunity, and for all GRID Alternative staff for committing to do good work. Thanks to Laurie Guevara-Stone for reading an earlier version of this post and providing a quote. I just returned from a week in Lourdes, France. With 70 volunteers we guided a group of 50 elderly people, many seriously ill, on a religious pilgrimage. Millions of people travel to Lourdes each year to bathe in its springs that are supposed to have healing properties, after a young girl had 18 visions of the Virgin Mary there in 1858. I am not a devout Catholic and I don’t believe in the miraculous healing properties of Lourdes’ water. So why did I go? I went because I wanted to help. My motivations are quite selfish, really: I know that serving others fills me with positive energy. Here are three lessons I learned from a week with 50 elderly people. 1. Compassion can be cultivated. We know that we can show kindness to our friends, and that on a good day we may even help a stranger in the street. But can we be kind to everyone? Surely there are some people we just don’t get along with! In Lourdes I realized that it is possible to develop sincere kindness for anyone. On my first day, I felt repelled by an elderly man in his wheelchair. Subjecting my immediate reaction to walk away, I started a conversation with him. After chatting for fifteen minutes I had seen so many commonalities between us that my initial feeling of repulsion had shifted to sincere compassion. Through this incident I realized that we can cultivate compassion, even for people who we initially despise, if we just have an opportunity to see their humanity. That’s exactly the insight that drove an Israeli restaurant owner to offer 50% discount on meals in his restaurant shared by Palestinians and Israelis. This Zen Habits guide of 7 practices will help mean—and maybe you too—to be more compassionate. Following the logic of Effective Altruism, it is easy to conclude that helping a few elderly people does not matter. “Why would I spend a week pushing old people in a wheelchair if I can work on a scalable solution for healthcare?” I think the lens of “impact” fails here for two reasons. First, I believe that if everyone would take care of their neighbors, the world would be a better place. Second, I believe that when we help someone directly, we are reminded what really matters in life. This causes ripple effects in how we choose our careers and lives. 3. Religion can be a powerful framework for personal growth. In an interview with New Scientist, E.O. Wilson said that we should eliminate religion because it causes great danger to our humanity. After Lourdes my view of religion is much more positive. Going to mass every day, I saw that religion can be a framework to become a better person. By reading stories of saintly behavior; reflecting on your own actions (and sins); and wishing each other peace during mass, religion can help people to be kinder. That is why I recommend everyone to read Alain de Botton’s book Religion for Atheists. In summary, the week reminded me how helping others truly is “food for the soul”. It also reminded me that I should treasure the moments I still have with my grandparents. What role does service play in your life? Are there experiences that have transformed you? Which experiences would you still like to live? Victor, Irene, Titiaan, Lisanne, Thomas, and Pim. Photo credit: Brendan Curran. 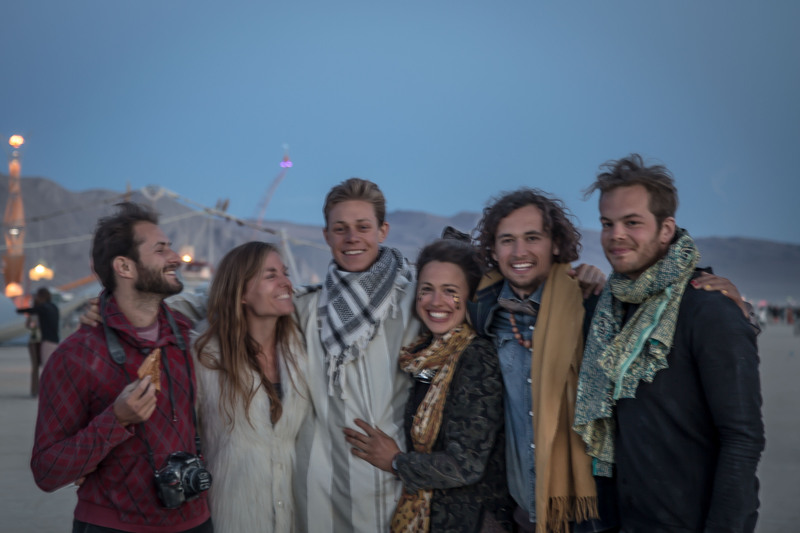 Some of my best Dutch friends decided to come to Burning Man this year. Thanks to Jan Overgoor, about half of them could stay at my camp, Mooncheese, making it easy to find each other. Throughout the week, we actively looked for each other to go on walks and adventures, creating time to reflect on past experiences and discuss new adventures. Having several hours of uninterrupted time to talk with such dear friends was rare and heartwarming. In parallel, I had some enlightening conversations with people who I had never or barely met before. IDEATE, a camp run by changemakers in sustainability and social justice, was a particular example of an oasis again which led to many interesting conversations—with topics ranging from spiritual enlightenment to how to reduce Burning Man’s carbon footprint. Everyone who comes to Burning Man tries to give something to the larger Burning Man community. Mooncheese served grilled cheese sandwiches at night; Shamandome offered healings and other guided spiritual workshops; and IDEATE organized speaker series. On one of our nightly adventures, we even discovered a one-person Caribbean bar at a 15-minute biking distance from the city! In our everyday lives, we think about what we want to get, with the implicit assumption that getting things will make us happy. It’s powerful to realize how much joy comes from giving. 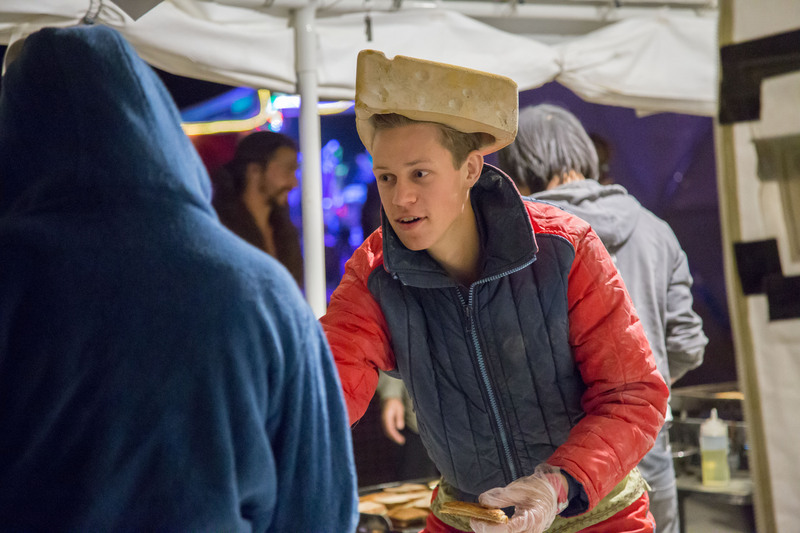 For many in Mooncheese, the best moment of Burning Man were the 2 hours of their grilled cheese shift, during which they prepared and handed out grilled cheese sandwiches to hungry people. For me, spending a few hours to help a friend prepare a meal and to help someone fix a flat tire stand out as highlights in the week. It’s worth remembering daily how much joy comes from providing small acts of kindness—I try to continue to live this message as I return to normal life. One special experience this year was to take part in a 5 Rhythms dance session. At 10am on a Friday morning, 200 people (all sober, or at least most of them) gathered on a wooden dance floor to move to the tunes of a Swedish DJ. His music started very slow, but progressed to more upbeat to a strong climax and back, hence the name 5 Rhythms. During the second hour of the dance session, you could see in everyone’s eyes true compassion for the other people on the floor. It was a totally different experience than seeing the judging way people look at each other on their morning commute by bus or metro. The tough environmental conditions—this year was particularly bad, with several white-out dust storms and temperatures occasionally dropping below freezing point—further increase the connectedness. You had to hug people, just to get some of their body heat. Serving grilled cheese with Mooncheese camp. Photo credit: Brendan Curran. I definitely plan to go again next year. My intention is to go with a small camp that has a strong commitment to service—I’ve realized that spending a few hours each day serving others is a gift. As a friend, Ed Silhol, said “Burning Man is my school”, a place to learn new things through service. For those of you who’ve never been to Burning Man: to me, the experience is best compared to visiting a city as a tourist. You spend time reading the map, trying to understand the city’s design, deciding which buildings and events you want to visit, making new friends and visiting acquaintances. Already after a few days in the new city, you feel increasingly at home. That’s what it feels like at Burning Man. Since moving to Colorado, I spend more time outdoors than before. On the flipside, I spend less time meeting new people, and less time making ideas happen. Why? Because living in the mountains influences what you think of and what you’re invited to. Where you live defines how you live. This realization made me think back of the places I’ve previously lived. 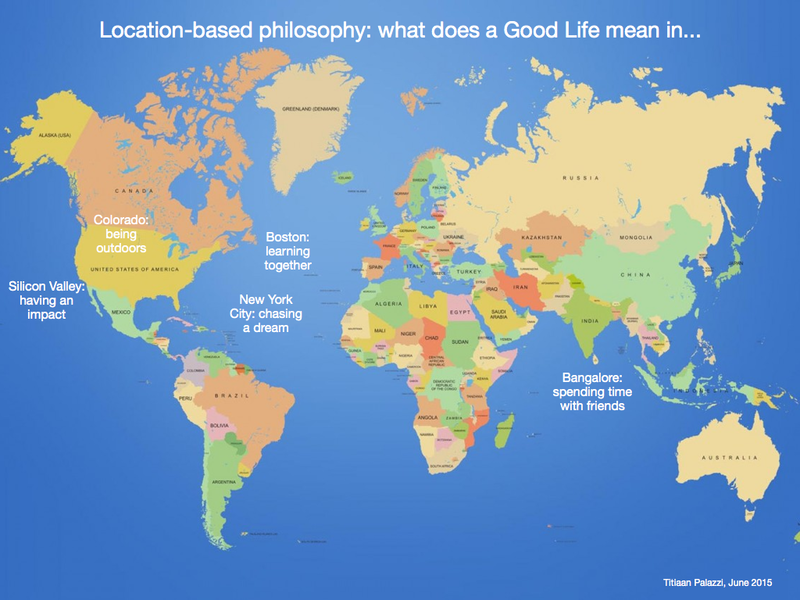 I realize that the definition of a good life varies for each location. So what does it mean to live a Good Life? A perfect week for a Coloradan includes a climbing-adventure, rafting down a river, and backpacking—ideally all together with friends. Most men in Colorado grow beards, so I stand out perfectly as a beardless European. Work, for many, is second in priority for most to the life outdoors. When you stand still on a NYC-street, observing the crowd passing by, everyone is going somewhere in a hurry. Each New Yorker seems to follow the Hero’s Journey: hearing a call to adventure, then following Joseph Campbell’s cycle to make it real. New York is the ultimate anti-Buddhist city, because attachment to goals reigns supreme. In Cambridge, people seem to care less about what you do, and more about what you think. People—many of whom are graduate students at some of the world’s best higher education institutes—are curious to learn, and to explore topics together. I’ve learned about the way hummingbirds flap wings and how religions grow, all in a single conversation. It’s difficult for me to define a good life in Amsterdam. For some friends, a good life is defined by a promising career with a top-tier consulting firm or big corporate. For some friends, a good life is defined by starting creative projects. For some friends, a good life is defined by building a startup. One thing that almost all my Dutch peers value is travel—that’s why you see Dutchies everywhere around the world. In India, more than in the United States or Europe, spending time with friends is important. When you walk the streets of Bangalore or Chennai, you see people everywhere chatting: at the chai-stand, while buying vegetables on the market, or simply standing outside. I think this culture will disappear as the country becomes more Western—Bangalore is already more “rushed” than a smaller city like Jaipur. Have you experienced the places above differently? Which other places have distinct philosophies? Where do you live now, and does the local philosophy fit yours? Of course, the local philosophies above are generalizations. In each city, you can find many different groups of people (i.e., tribes), each with their own philosophies. I still believe the location is important, though. In Aspen, the surrounding mountains call you to a life outdoors; in New York City, the never-ending bustle makes it natural to spend time with other people. The most important questions in the world? As he said this, I realized that how you evaluate your days determines the person you become. Did I create something meaningful? Did I learn something new? Did I make someone smile? Did I get better at my craft? Did I meet someone new? Have I become a wiser person? Did I encounter something unexpected? Did I do something that scared me? Did I work on something that can change the world? Did I invest in the people around me? Did I work with amazing people? It’s worth asking yourself: am I asking the right questions? There is no one-question-fits-all, but each question reflects certain values. Asking, “have I helped someone?” means you value compassion and kindness. Summing up what you’ve learnt at the end of the day indicates a commitment to personal growth. Which questions do you ask yourself at the end of your day? Do they reflect what you truly care about, or are they merely a product of your environment and the past? Thanks to Jan Overgoor for reviewing an earlier version of this post. On the plane from Aspen to NYC, I listened to an On Being podcast in which Krista Tippett interviews Paulo Coelho. It was so good, I listened to it twice. Download the podcast here. Achieving your goals does not result in joy. It is compelling to think that completing your goals will result in joy, but it’s often not true. Getting closer to goals—being on the path to fulfill a purpose—creates joy. Reaching the end goal can lead to sadness, because your journey is over, completed. Paulo Coelho describes how he experienced sadness when he completed his pilgrimage, reaching Santiago de Compostella. Start every day without expectations. Being a pilgrim means being open to life, being open to what the day brings you. “Every single day we have the chance to discover something new. Get rid of things that you are used to, and try something new.” This is a very powerful concept for me—seemingly opposite to the idea of having daily to-do lists and big hairy audacious goals. Your personal legend is your dream. It is something that gives you joy. The word “legend” does not refer to a heroic tale necessarily—your legend can be any story you are proud to live. Your personal legend can consist of gardening; raising a family; writing a book; creating a safe space where people can convene and grow; making paintings. “Either I move forward, or I die. I die probably not physically, but spiritually. The hardest choice in life is to fulfill what you are here to do. “You want to do something that is against the plans that other people have for you. There you face a very hard choice. Either you start living the dreams of someone else, or paying the price of your dream.” In his books he describes the process of not following your dreams as one of “spiritual death”. That’s something to fear. Coelho says he was a Buddhist, a Hare Krishna, a hippie, and a Christian. This is also what pilgrimage means: trying different things. That can be hard to embrace for young people—that following your personal legend includes uncovering your path. The only way to do so is to try a lot. This relates to Deepak Malholtra’s thought-provoking HBS speech on quitting (added at end of post). “Who am I?” is an eternal question… you will infinitely struggle with it. At the end of the interview, Coelho confesses, and then laughs about, the fact that even at his age he does not really know who he is. Powerful to keep in mind.